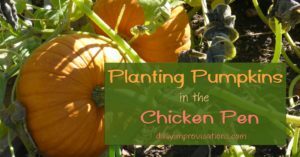 I’ve done things differently for this blog and just typed word for word what I was saying as I recorded the video about planting pumpkins in the chicken pen, except that I did add headings. And I remembered these old chicken cages that my husband made for me and I’ve gotten a lot of use out of them raising baby chicks, but they are just about on their last legs. And I’m not raising baby chicks this year. So, which brings us to another point. If you have chickens, it can be very much in your favor as a gardener to have two pen situations. So, my chickens, over here, have this one larger pen. 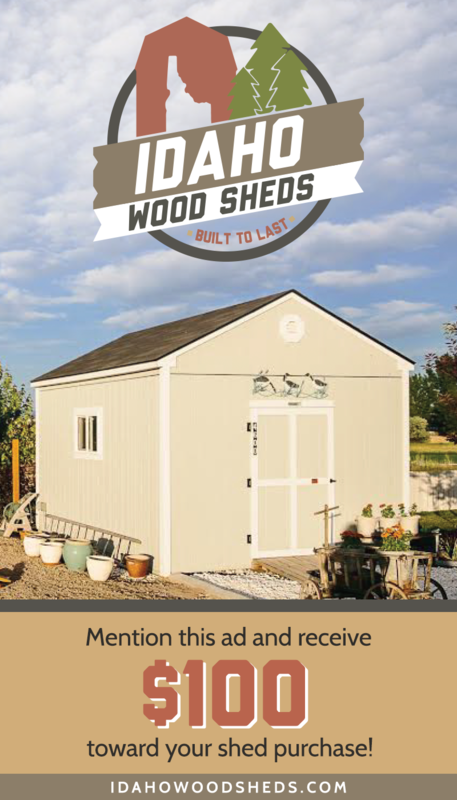 And you go look around the corner, there’s a coop, so they have almost twice as much space in there as you can see. And then – a couple of years ago, I decided I had too much garden to weed, so I turned this area into a chicken pen. But, I know that they can actually not be in here for a couple of weeks or a month or more and then, um, when I let them out again, they will weed it very, very quickly. 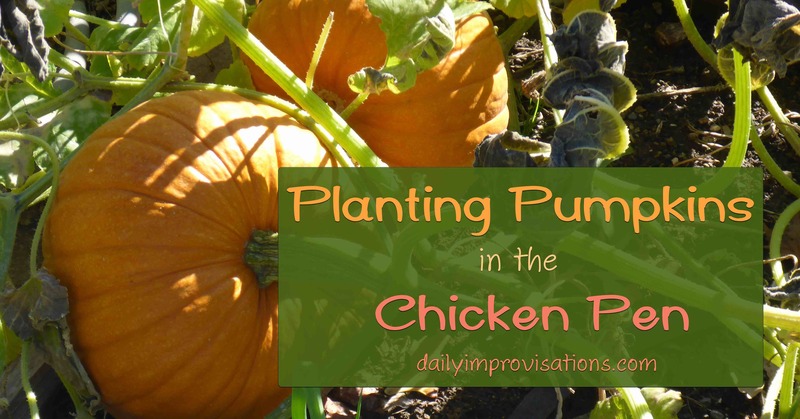 So, what I am going to do is, I am going to set up my chicken, my chick box pen in here and I am going to plant pumpkins in it here; and so – the box also has a lid, that’s the lid there – it will be able to grow for a while covered. And then I will have to decide if I will put a bigger wire cage over it for a little while, or if I will lock the chickens up for the remainder of the season. So, now I’m going to pull it in here. So, this is the gate that I walk into the chicken pen. So, you can see that I chose this spot over here because it won’t be in my walkway when I do need to go back in there and put them to bed, because that’s more secure for the night over there. And where their food and water are. And this spot was mostly level. Chickens scratch some pretty deep holes, but… it was more expedient for me to use these clumps of bunching onions that I put in here to block off that one spot that was, um, a place they might have been able to get under there. So, we’ll see how that works. And now I’m going to go get my pumpkin seeds. So, I’ve dug my spots there, to put the seeds about an inch to an inch and a half deep. And you can see I’m using the pumpkin: Small Sugar Pumpkin from Territorial Seed Company. Now, I will cover them up! The reason I don’t just let chickens run free in my garden is because I have tried that and they destroy everything, but I think this has the potential to be a good mix. So, now, I also have my little pot that I made to label this and I’m just going to leave that inside for now. And I’ll put the lid on and let the chickens out. You can see they’re not overly interested in that right now. They’re more interested in the spot where I moved the bunches of onions from because that exposes a bunch of other dirt and some other weeds that I put in here yesterday for them to eat. Yum yum!